The announcement by Chancellor George Osborne that a tax on sugary drinks is to be introduced in the UK came as a surprise - ministers had spent months suggesting they were against the idea. But just how bold is it? There are two ways of looking at it. Firstly, the government has made a pretty radical step. Only a handful of countries have introduced such a levy and for a right-of-centre administration to do so is quite remarkable, and shows a strong commitment to tackling child obesity. The other - less generous interpretation - is that they were backed into a corner. Not only did pretty much the whole health lobby want it to happen, but TV chef Jamie Oliver led a pretty impressive campaign - a petition he set up attracted more than 150,000 signatures. No government wants to get on the wrong side of public opinion. But the more important question is whether this will have an impact on child obesity rates. One in 10 children start primary school obese. By the end, one in five are obese. If you add in those who are overweight, it's one in three. There are many reasons for this. Children are more sedentary than they used to be - as are adults. And our diets are simply not good enough. Earlier this year the Food Foundation produced a model of a typical family's diet. Every member consumed too much sugar and saturated fat and too little fibre, fruit, vegetables and oily fish. So why tax sugar? All age groups consume at least twice as much as they should. 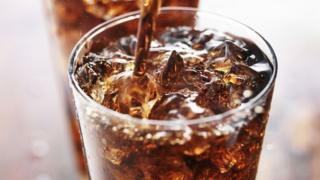 Teenagers have three times as much - with sugary drinks their biggest source of the sweet stuff. It's easy to understand why. A typical can of fizzy drink contains enough sugar to take both adults and children over their recommended amount. There is evidence to suggest that a tax will have an impact on this. When Mexico introduced a tax of 10%, consumption fell by 6%. Indeed, the Office for Budget Responsibility, which provides economic forecasts for ministers, has already done some modelling. Its assumption is that for the government to raise the £520m a year it has said it will, it will need to introduce a levy of 18p and 24p per litre (the plan is for two tax bands depending on how much sugar is in the drink). The government has not confirmed whether this is the level being thought about as it wants to carry out a consultation. But it is as good a figure as we have at this stage. The analysis predicts that there will be a 5% drop in sales of the highest sugar drinks, but a 2% rise in lower sugar drinks. That would seem to be a pretty minor gain. But in a way campaigners say that misses the point. The sugar tax carries a symbolic message. That is to say obesity is now such a serious problem that it requires direct intervention. Short of a ban, a tax is arguably the next toughest measure open to a government. However, this should not be seen in isolation. The government is expected to publish its much delayed child obesity strategy in the summer. That could include restrictions on advertising and marketing, as well as a sustained campaign to reduce the sugar content of foods and drinks across the board. A sugar tax may be in the headlines at the moment, but it looks like it will just be the start of the fight against our bulging waistlines. We will have to wait and see to judge just how bold the government really is.